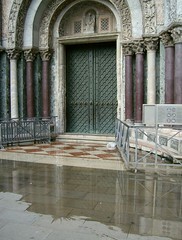 One of the most remarkable things in Venice was the flooding – water is seeping up into the Piazza San Marco (and other areas) on I think pretty much a daily basis depending on tides and seasons. I took this photo on June 27 when things should be pretty dry compared to the fall when winds can bring higher tides. Also interesting is that this area was fine a few hours earlier. The water on the 26th at this point was – I think – about a foot deep. We could not even get over to the church the day before. Not sure about tides but I assume they play a big role in this flooding, which is threatening Venice’s amazing buildings. A complex underwater dam system is almost completed but I’m not clear how optimistic folks are about that.